MBA / Master in Supply Chain Management / Master in Procurement from an HEC recognized University or abroad. Should have minimum 10 years work experience in procurements/contract management, including minimum 7 years in dealing with procurements in the public sector under Public Procurement Rules of Federal / Provincial Governments. Must be very well versant with Public Procurement Rules and must have in-depth knowledge of public sector procurements. Will be the overall responsibility to manage the procurements of the Corporation. Age, not more than 55 years. Law Graduate from the HEC recognized university having 07 years experience as Company Secretary in a listed organization OR. ACA / ACMA / ICSP having at least 5 years experience a Company Secretary in a listed organization. Practical knowledge of corporate laws, regulations and secretarial practices especially the Company Act and Listing Regulations of PSX. Able to draft minutes of Board and Shareholders' meetings etc. and to interact with members of the Board. Should be a computer literate with advanced knowledge of MS Office. Have excellent analytical and communication skills. Age, not more than 50 years. A Law Graduate or a Licentiate Member of the Institute of Corporate Secretaries of Pakista (ICSP) or a recognized accounting/corporate professional body or higher qualification. Should have at least two years experience of competently working as a second in command, handling the Corporate Affairs of a listed company of repute who could be assigned the senior level position in the Corporation. Should be well versed with the provisions of the Companies Act 2017, Code of Corporate Governance / Listed Companies (Code of Corporate Governance) Regulations, Pakistan Stock Exchange Rule Book and other laws, rules and regulation normally applicable to listed companies and statutory corporations. Should be a computer literate and have excellent communication skills with the ability to draft minutes of the Board and its Sub-Committees meetings and Shareholders meetings. Age, not more than 45 years. Certificate of Competency Class 1 (Motor or Combine). More than 02 years of sailing experience as Chief Engineer on Bulk Carriers with Cargo Cranes preferably. 1-2 years experience as Superintendent Engineer in reputable shipping company would be preferred. More than 02 years of sailing experience as Chief Engineer on Oil Tankers preferably. Further details can be downloaded from PNSC website www.pnsc.com.pk. 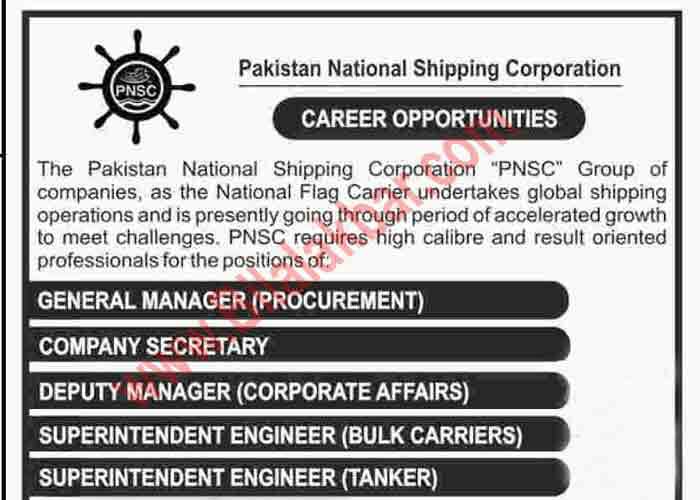 Interested candidates may apply through PNSC online application form available at PNSC website www.pnsc.com.pk. The last date for submission of application is 25th November 2018.